Twitter is an online news and social networking service where users post and interact with messages, called “tweets.” Twitter messages were originally restricted to 140 characters, but on November 7, 2017, the limit was doubled to 280 characters. This is for all languages with the exception of Japanese, Korean and Chinese. Twitter is available in more than 25 languages, including right-to-left languages like Arabic, Farsi, Hebrew and Urdu. 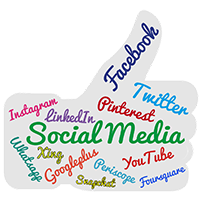 Approximately 16% of customers use Facebook, Twitter and the other major social networks in order to interact with businesses. Determining who your target audience will be or what you want to achieve is an important step in setting up or modifying your Twitter profile. What you want to achieve can be to find new customers, support existing customers or to establish yourself as an industry authority. – Direct Message (DM) – a private message between two users. Direct messages can only be send to followers. – Hashtag (#) – search tool which allows you to find tweets, based on topics. Your tweets, should contain hashtags to enable followers to search for your tweets. Twitter posts the trending hashtags for each day. A good ideas is thus to create a hashtag for your brand. This can improve your overall brand visibility. – Mention (@) – reference another Twitter user by mentioning their Twitter handle. They will be notified when referenced. – Retweet (RT) – sharing a tweet that someone else has posted. Getting your posts retweeted by other users can increase your exposure and overall brand awareness. – Tweet – a Twitter post of no loger then 140 characters. The key to Twitter as with other social platforms, is engagement. Retweeting, using hashtags and liking posts can increase following for your brand or business. Provide potential customers with information with which they can relate. Business owners and entrepreneurs can indirectly relate to potential customers by retweeting interesting posts and using by using trending hashtags in their posts. Twitter product cards allows more information about a product than you could fit in a standard, 140 character tweet. Product cards allow you to display the product name and an image, along the description. By visiting the pages of followers, you can obtain a picture of how they interact and engage with other users of the platform. This will assist in establishing a quick user profile, which cam assist in determining their likes and interests. Research popular hashtags and then use these hashtags in your tweets. This will allow a new audience to have access to your profile. As a side note, do not include more than two hashtags in a tweet. Another way to engage external users is to retweet posts that you find interesting. Promoting others users posts via retweeting can increase exposure, as these would in return retweet interesting posts that you publish. Keep your followers intrigued. Do not reveal too much information. Posting teasers can entice users to leave platform in order to visit your store. Also attempt to include interesting links to things that are relevant to your industry. Consider when you tweet. The weekend is a an appropriate time for brands to tweet about their products and activities. Make use of scheduling tools like Hooutsuite in order to schedule tweets to be posted at times when you are unavailable. Twitter is a live and ever changing stream. Attempt to tweet 4 to 5 times a day to prevent your tweets from being missed. 8. Twitter is a very powerful platform. If used correctly you can increase your reach exponentially. Posted in Ecommerce, Marketing, SEO, Social Media and tagged twitter.